US To Play Larger Role With Honda? The increasing sales success of Honda North America (HNA) has led to Honda brass in Japan reorganizing regional operations here. The management shuffling here and in Japan is intended to both streamline and confer more responsibility on HNA "as the region assumes a larger role in shaping Honda's global business," and as Honda builds more facilities that serve several roles in the product development pipeline. Honda's executive vice president and president of HNA Tetsuo Iwamura was named COO of automotive operations, taking over a position that had been handled by company president Takanobu Ito. Iwamura's new role puts him in charge of anything Honda makes that has four wheels, which Automotive News saysequates to 78 percent of the company's global revenue. The current company CFO, Fumihiko Ike, will fill the now-vacant role of company chairman and Kohei Takeuchi will take his place. Takeuchi is presently the operating officer, general manager of the accounting division. The executive swaps take effect April 1, 2013. Beyond that, a company called Honda North America Services (HNAS) will integrate IT systems, human resources and other responsibilities and streamline operations such as purchasing and manufacturing. It will pluck 50 employees from Honda's offices in Torrance, California, the new company being based in Honda's offices in Marysville, Ohio. Honda wants to "deliver high quality products to the consumer more quickly and efficiently," and HNA is also expected to have more input into product development. 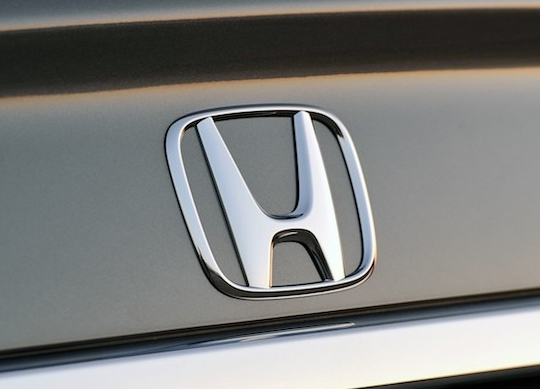 Honda won't confirm it, but that could mean that the next Honda Accord is developed here. The completely redesigned 2013 Honda Accord Coupe has earned the highest available safety rating – a 5-Star1 Overall Vehicle Score from the National Highway Traffic Safety Administration (NHTSA). 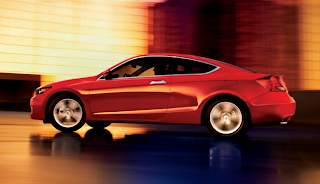 The 2013 Accord Coupe is the only vehicle in its class to earn a NHTSA 5-star Overall Vehicle Score and Insurance Institute for Highway Safety (IIHS) TOP SAFETY PICK+ rating with GOOD ratings in all test modes. 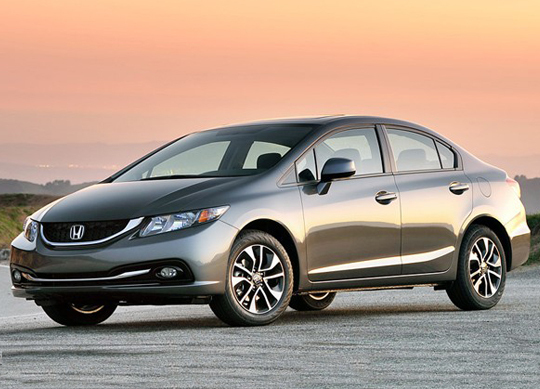 For model year 2013, all tested Honda models have earned a TOP SAFETY PICK or TOP SAFETY PICK+ rating from the IIHS (only the Civic Coupe, FCX Clarity and Fit EV have not been tested). "The Honda comprehensive approach to vehicle safety is validated by these top-level safety ratings," said Art St. Cyr, vice president of product planning and logistics at American Honda. "The 2013 Honda Accord truly excels in all areas, delivering the best overall safety ratings, while also providing exhilarating performance, outstanding comfort and top-class fuel economy." 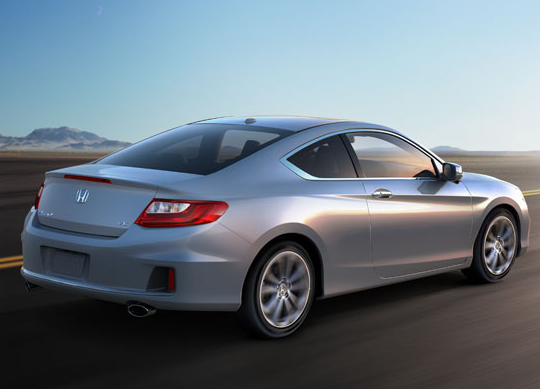 The Accord Coupe earned the 5-star Overall Vehicle Score by garnering a 5-star rating in each seating position in the New Car Assessment Program (NCAP) frontal, side-barrier, and side-pole crash test categories, as well as a 5-star rollover rating. The 2013 Coupe joins the Honda Accord Sedan in earning an Overall 5-Star Safety Rating under NHTSA's testing. In addition to its NCAP 5-Star Overall Vehicle Score designation, the 2013 Honda Accord Sedan is the only car in its class to earn a GOOD rating in all IIHS test modes, including the Institute's aggressive, new small overlap frontal crash test. Under the IIHS' testing program, the new small overlap frontal crash test—sometimes called a "narrow offset" test—is designed to replicate what happens when the front corner of a vehicle collides with another vehicle or an object such as a tree or utility pole at high speed. Beginning with the 2013 Honda Accord, Honda is applying the second generation of the Honda Advanced Compatibility Engineering™ (ACE™ II) body structure to its models. This reinforced frontal structure further enhances frontal crash energy management through a wider range of offset and oblique collision modes. New standard and available safety and visibility technologies in Accord models such as Back-Up Camera, Forward Collision Warning (FCW), Lane Departure Warning (LDW) and Lane Watch help increase driver awareness in the front, sides, and rear of the vehicle. In addition to the Honda next-generation Advanced Compatibility (ACE II) body structure, passive-safety features offered as standard equipment on the 2013 Accord include dual-stage, multiple-threshold front airbags, and new SmartVent™ front side airbags, and side curtain airbags. The new SmartVent side airbag construction helps mitigate the risk of injury to occupants that may be positioned in the deployment path of the side airbag. SmartVent also allows heating of the passenger seatback on EX-L and Touring models. Honda has a long history of leadership in the development and application of advanced technologies and designs to enhance the safety of all road users, including automobile occupants, motorcycle riders, and pedestrians. The company operates two of the world's most sophisticated crash test facilities and is responsible for numerous pioneering efforts in the areas of crashworthiness, airbag technology, collision compatibility and pedestrian safety. This commitment to safety is rooted in the longstanding Honda goal to be a company that society wants to exist, and it complements the company's leadership in reducing vehicle emissions, improving fuel efficiency and advancing alternatives to gasoline. Each year, U.S. News and World Report conducts its annual ‘Best Cars for the Money’ awards which highlight vehicles within several categories based on the ratings of professional automotive critics. Vehicles are judged across a number of factors including performance, reliability, interior quality and safety. The awards are also based on the average price paid for a particular car and five-year cost of ownership data. The ‘Best Cars for the Money’ award winners are those that excel in these areas and are ultimately a great long-term value. "When we initially heard rumors of an "emergency refresh" coming for the 2013 Civic, we honestly didn't expect much – the era of massive year-over-year changes died decades ago, after all. Butwhat arrived at November's Los Angeles Auto Show was a whole lot more comprehensive in scope than what we anticipated. To begin with, the 2013 Civic's nose features a thoroughly updated look, with a more complex hood stamping, larger mesh grille opening framed by a chrome-edged smile, more expressive headlamps and a reworked lower fascia with a fillet of brightwork that does wonders to help the design look more upscale. In profile, with the exception of fresh wheel patterns, the look stays largely as it was for 2012, with the same aggressively raked greenhouse and fuss-free sheetmetal contours. Out back, a redesigned trunklid houses a better-integrated license plate pocket and a chrome trim strip is bookended by larger and more elaborate two-piece taillamps. Overall, we think the look is a major improvement, appearing far more sophisticated than the 2012 car, which was at best an incremental improvement over the admittedly radical eighth-generation model. But the 2012 Civic's personal Waterloo wasn't really its exterior – it was inside where the car stumbled. A quick peek at Honda owner forums reveals that existing Civic drivers who came in looking to trade their cars for a 2012 model were disappointed with the noticeable cheapening of cabin materials. That's been rectified for 2013, with more soft-touch plastics, convincing faux stitching on the dashboard and doors, a richer headliner, nicer upholstery and, in general, a more premium aura. The unique two-tier dashboard strategy remains, and while it looks busy, it's quite easy to get used to. Items like a backup camera, Bluetooth telephony/streaming audio and Pandora integration are welcome standard equipment additions, but the biggest improvement to the cabin isn't something you can put a finger on, because it lies beneath. A canopy of additional sound deadening has been added to the firewall, wheel wells and flooring, and a thicker windshield and front-row side windows further mute the outside world. Hondas have rarely been known for their noise abatement abilities, but the 2013 update helps bring a welcome composure to the Civic's cabin, cutting powertrain noise noticeably under acceleration, and road and wind noise everywhere else." See how Honda continues to push the elements of design, function and form with the Urban SUV concept. Stick with the brand that America trusts, and stop by Pacific Honda to see where your favorite car company can take you!! You have to come down to Pacific Honda and Check out the last day of the President's Day event! This is the largest sale of the year and you don't want to miss great deals like the 2013 Pilot Touring 4WD for only $510 a month! Don't buy a Honda until you've checked Pacific Honda's Prices! 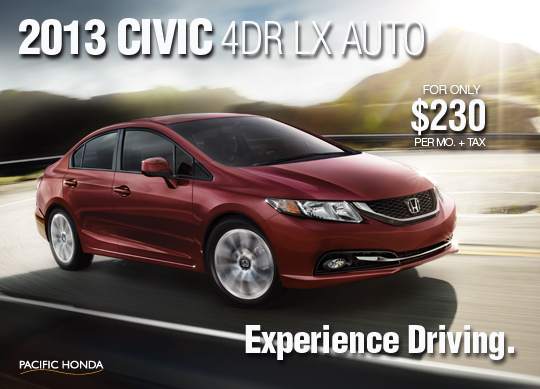 Check out this great demo video on the 2013 Honda Civic Sedan! After much anticipation, the 2013 Honda Accord has finally arrived in San Diego showrooms and has proven to be worth the wait. The latest Accord debuted with an all-new design that has already garnered industry praise. Paired with a few other enhancements and upgrades, the 2013 Honda Accord is perhaps the most irresistible yet. The Honda dealers that Lemon Grove consumers visit are now offering a restyled Accord that is both cutting edge and conservative. The Accord is slightly smaller than its predecessor giving it a more sporty look that is enhanced by sleek character lines and a redesigned front end. Inside, a clean layout of controls and the use of high-quality materials throughout give the Accord an upscale appeal not expected in a vehicle with such an affordable price tag. The Honda Accord Mira Mesa consumers can now purchase is more powerful than its predecessor thanks to an all-new engine. The base 2.4-liter engine gets direct injection technology and boosts horsepower by 4% compared to last year’s model. Honda also enhanced the available 3.5-liter V6 engine which now develops 278 horsepower. Despite the increase in power, the Accord is still the efficient, high-value car that we know and love. The combination of an upgraded powertrain and the reliability and value the Accord is known for is very exciting! 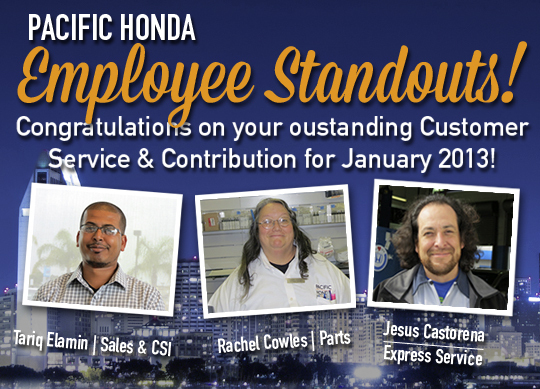 At Pacific Honda, we like to take some time out to recognize our employees who not only make great strides in productivity, but also make Pacific Honda a great place to be! Here are some that created a great work environment in January! 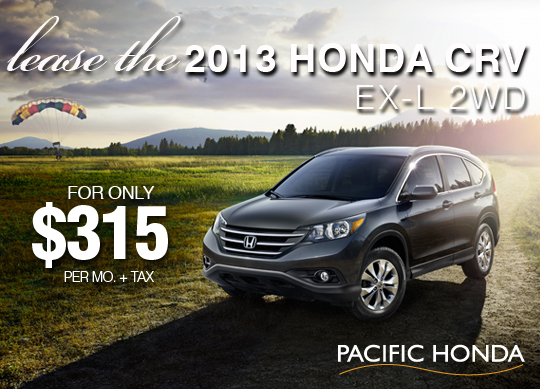 The 2013 Honda CRV EX-L is rocking the streets at 31 MPG for only $315 a month. 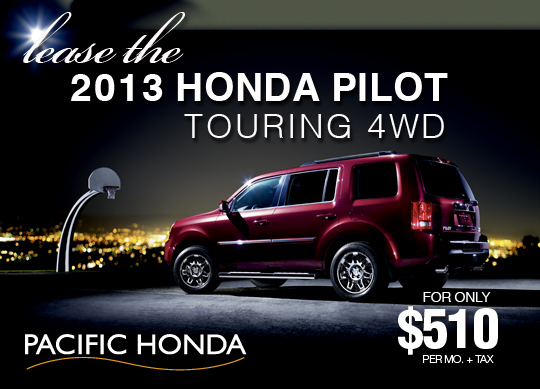 Stop by Pacific Honda and take a spin in the SUV that brings the adventure to you!! At the end of last year, automotive experts from Car and Driver test drove every 2013 model under $80,000 to compile their annual ‘10Best’ list. The vehicles that make the coveted list are those that exude automotive excellence for less than the average cost of a new car. For residents of California on the market for a new car, Car and Driver’s ‘10Best’ list suggests you can’t go wrong with the Honda Accord. The 2013 Honda Accord landed on Car and Driver’s ‘10Best’ list for a record 27th time and it’s not hard to see why. Mira Mesa Honda Accord consumers have praised the attractive styling of the fully redesigned Accord but Car and Driver editors say it’s the car’s inner beauty that earned it its 27th appearance on the ‘10Best’ list. While the stylish good looks of the newest Accord certainly don’t hurt, Car and Driver says it’s the car’s upscale, spacious interior, refined drive and affordable price tag that warrant the most praise. Inside the Accord, an elegant cockpit design and the use of high-quality materials will have San Diego consumers stunned at the upscale allure of such an affordable car. Also new for the 2013 Accord is HondaLink, an infotainment system that integrates internet audio streaming and social media apps through your smartphone. In addition to its lavish allure, the Accord boasts a roomy interior and ample cargo space despite its smaller exterior dimensions. Compared to the previous model, the 2013 Accord San Diego dealers are offering is slightly smaller and slightly lighter. The subtle changes make the Accord a class leader when it comes to fuel economy and make for a refined, agile drive. The 2013 Accord also gets power and efficiency enhancing direct fuel injection which results in more power and better gas mileage than its predecessor. While there’s no denying the 2013 Honda Accord is certainly a looker, its lavish interior and refined drive are what industry experts find most attractive. Paired with its affordable price tag and record setting 27 appearances on Car and Driver’s ‘10Best’ list, Mira Mesa residents on the market for a new car can’t go wrong with the 2013 Accord. At 39 MPG (Hwy) the 2013 Civic allows you to go where you want without emptying your pockets. 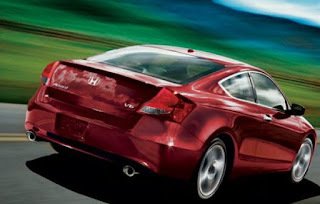 Stop by Pacific Honda this weekend and ask to test drive a brand new Civic...the car that lets you experience driving! Honda is getting warmed up for the upcoming Geneva Motor Show, with a sketch of some very Euro-flavored forbidden fruit. 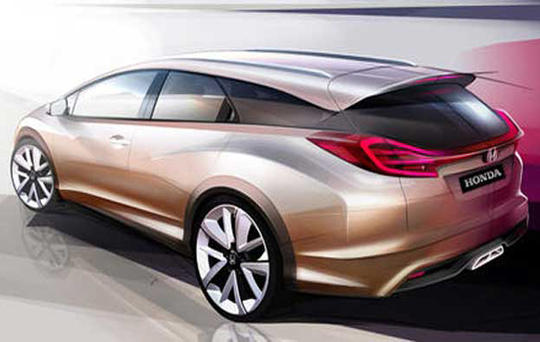 Seen above (click on the image to see an expanded view) is the Honda Civic Wagon Concept Model – a rather tentative name for a car that Honda claims "provides strong cues for the exterior design of the final mass produced version." The sketch seen here is obviously very stylized, but we think that if Honda can stay true to its sleek rounded forms and aggressive silhouette, the final product could be quite fetching. Note that this is an image handed out by Honda of Europe, for a European auto show – we have every expectation that that any production-ready Civic wagon will be a Europe-only deal. Sorry, guys. Find Honda's brief press release below, which also includes news of the European debut of the updated NSX Concept we saw at January's Detroit Auto Show, along with a diesel-powered CR-V. Check out the innovative all-new 2013 Honda Accord Sedan. Honda is not only making driving much safer, but creating more efficient, Earth friendly cars! 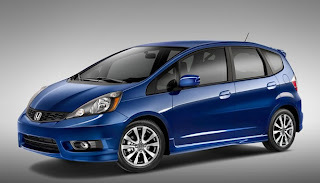 The all-new 2013 Honda Fit is in Car & Drive 10 Best for the 7th year in a row! With 35 MPG & a monthly payment of only $159 per month + tax, this car is a must have!! 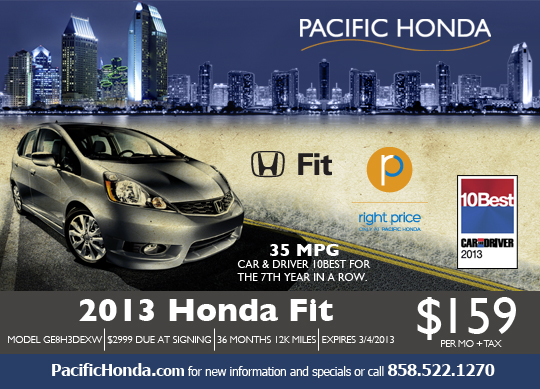 Come by Pacific Honda today and see why the Honda Fit continues to shine! Disclaimer: FEATURED LEASE: Closed end lease for 2013 Fit 5 Speed Automatic (GE8H3DEXW) available from January 16, 2013 through March 4, 2013, to well-qualified lessees approved by Honda Financial Services. Not all lessees will qualify. Higher lease rates apply for lessees with lower credit ratings. Must take new retail delivery on vehicle from dealer stock by January 31, 2013. Lessee responsible for maintenance, excessive wear/tear and 15¢/mile over 12,000 miles/year for vehicles with MSRP less than $30,000, and 20¢/mile over 12,000 miles/year for vehicles with MSRP of $30,000 or more.